Ergonomic accessories, especially standing desks, have become one of the newest trends in office design in recent years. More and more office workers realise the danger of a sedentary office lifestyle. Ergonomic by nature, these desks let you alternate your position throughout the day, thus preventing many unpleasant conditions borne out of sitting too long such as neck pains or back pains. 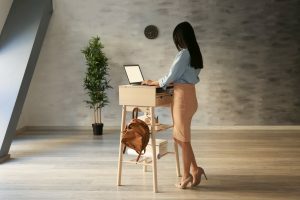 However, as sitting has become the norm in offices, some white-collar workers are still hesitant towards this trend, wondering whether the desks are worth it. Let’s find out together through this article. Believe it or not, standing desks are not a modern invention! Standing desks, or sit-stand desks, as some would prefer to call them, have been around for some time, dating back to the days of the genius inventor Leonardo da Vinci, who painted his masterpieces, including the ubiquitous Mona Lisa, while standing. Leonardo da Vinci was not the only one who enjoyed standing. Thomas Jefferson was also a great fan of working while standing. In fact, he might have been the very first inventor of modern standing desks. Other famous people who enjoyed standing while working included British Prime Minister Winston Churchill, Author Charles Dickens and novelist Ernest Hemingway. - Lower your risk of weight gains and obesity: Prolonged sitting causes obesity and weight gains because when you sit, you cannot burn calories through exercise, thus gaining more than you can burn. By using sit-stand desks, you will burn as much as 170 calories per day as compared to sitting, helping you to balance your calories intake. - Lower your blood sugar level: High blood sugar level will leave you at risk of getting diabetes. Alternating between sitting and standing will lower blood sugar spikes by as much as 11,1% on average, helping to keep you one step away from diabetes. - Ease back pain: Back pain plagues office life, and we all have to experience it once in a while. In a study published by the CDC (Centre of Disease Control), it is reported that standing desks reduced up to 54% of participants’ neck pain and back pain in just 4 weeks. This effect is also observed in many other studies, making standing desks one of the best tools against back pain. In conclusion, are they worth it? Definitely yes! With a lot of proven benefits for your health. Now that standing desks are at such affordable prices, what more can you ask for? If the prices still have not convinced you, we at Back2 are happy to help! Our range of high-quality standing desks is made just for you at very affordable prices. If you need more advice on healthy workstations, our certified DSE assessors will certainly be happy to assist you. For more information, do not hesitate to contact us at 020 7935 0351 or through here. Posted in on 8th April 2019 by Back2.